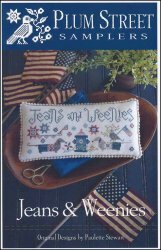 Jeans & Weenies [C7105] - $10.00 : Yarn Tree, Your wholesale source for cross stitch supplies. Cross stitch pattern from Plum Street Samplers. A patriotic design with two weenie dogs dressed in blue jeans. An eagle is holding a flag on the back of one of the dogs. The fire hydrant in the center is decorated in patriotic colors. Stars and floral motifs accent. Stitch count 157w x 66h.